Generally speaking, a namespace (sometimes also called a context) is a naming system for making names unique to avoid ambiguity. Everybody knows a namespacing system from daily life, i.e. 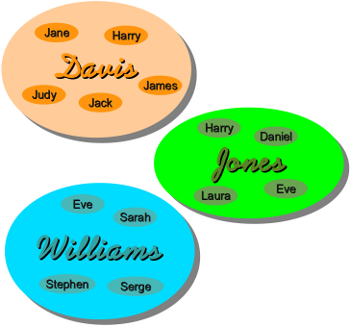 the naming of people in firstname and familiy name (surname). Another example is a network: each network device (workstation, server, printer, ...) needs a unique name and address. Yet another example is the directory structure of file systems. The same file name can be used in different directories, the files can be uniquely accessed via the pathnames. Many programming languages use namespaces or contexts for identifiers. An identifier defined in a namespace is associated with that namespace. This way, the same identifier can be independently defined in multiple namespaces. (Like the same file names in different directories) Programming languages, which support namespaces, may have different rules that determine to which namespace an identifier belongs. Namespaces in Python are implemented as Python dictionaries, this means it is a mapping from names (keys) to objects (values). The user doesn't have to know this to write a Python program and when using namespaces. A scope refers to a region of a program where a namespace can be directly accessed, i.e. without using a namespace prefix. In other words: The scope of a name is the area of a program where this name can be unambiguously used, for example inside of a function. A name's namespace is identical to it's scope. Scopes are defined statically, but they are used dynamically.